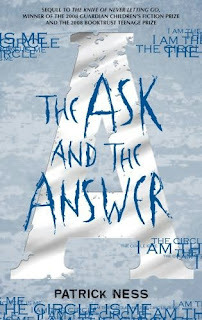 The second book in the Chaos Walking Series. After whizzing through The Knife of Never Letting Go, I was desperate to get my hands on this one. I was over the moon when the library got it in quite quickly for me. This book carries on exactly from where the first book finishes. This means that I can't tell you hardly anything, because that would give away the ending of book one and if you haven 't read it, you really need to. I will give you a little taster, just to make your mouth water, so look away if you don't want to know. Todd and Viola are now living in New Prentisstown, but they are living separately. Todd is with the men and Viola is living with the women. They no longer all live together and this gives off an uncomfortable whiff of blantant sexism, which I found quite difficult to read about. The women are treated so differently from the men, just because they don't have the Noise. The men feel threatened by their superior ability and this book becomes a war of the sexes. However, as a war breaks out, you become really unsure of which side is the right side to be rooting for as there is a very fine line separating their actions, that actually become blurry. By the end, I didn't know which side was right and which side was wrong. I found this book ran at a slower pace than The Knife of Letting Go and that I found to be a good thing, as I was left breathless by the first book. I didn't think there were as many twists and turns in it either and where the first book is full of the unexpected, I didn't find that with this one. I liked the book, I liked it a lot, but I don't think it was as good as the first book. However, I think this book is a bit like the lull before the storm, or similar to the eye of a twister, where time just stands still in silence. I imagine the third book is going to be the most powerful of the three and I do hope I am right. I think the main thing I didn't like about this book was that Viola and Todd were separated for the majority of the book. I liked reading about the two of them together as I found their relationship to be quite powerful. Within The Ask and the Answer, there is such distance between them, you end up feeling a little disappointed. It reminded me of New Moon by Stephanie Meyer, which I thought was the least enjoyable of the four books, as the relationship between Edward and Bella was non existent throughout that book. Perhaps I am just a hopeless romantic, but when you witness a romance blossoming, you hope they will stay together until the end. If you have read either of these books, then you need to. Start with The Knife of Never Letting Go for the roller coaster ride, followed by a slow carousel in The Ask and The Answer and be ready for the terrifying free fall ( I have my fingers crossed on this one, please don't disappoint me Mr Ness) of the next book, Monsters of Men which is not out until 2010. Another set of books I need to get. Book blogs are detrimental to my BBB. I need to exercise self-control. Into the wish list this and the first book go! Funnily enough last night I was given a bag of books that a neighbour thought I might like to borrow - one of those books was The Ask And The Answer. Is it possible to read it as a stand-alone novel or should I really be reading part one first in order for part two to make sense? I haven't read The Knife of Letting Go yet, but I hope to get the chance to read it in the future! After being pretty lukewarm about Knife, I started this one about a month ago, read the first two chapters, and put it aside, never to go back. I realized I just didn't care anymore what happened, and I didn't want to subject myself to the same sort of ride I went through in Knife, so I gave away my copy on bookmooch instead. Hi, Viviene! Like you, I really enjoyed reading this book. And again, like you, I think it's not as good as the first one, but it still is a good read though. I can't wait for the 3rd book. I keep imagining the scenarios that Patrick Ness has planned for the final book of the trilogy. Also, after reading the first book, I've thought about what would it be like if people can hear my thoughts. I guess I wouldn't have any friends if that's the case. hehehe. Okay, once again, I had to stop myself from reading your review. *pouting away* But I want to read this very soon, so I'm just going to wait until I finish myself first. I see by your sidebar you've started Rebecca - how are you finding that so far? It sounds as though you are really enjoying these....I am adding The Knife of Letting Go to my wish list. I love the cover of it, too. Joanna - glad you like the cupcakes, you need to come back on Saturday to see some more. You definitely need to read this. Alice - sorry that I make you buy more books. Tee hee. I hope you like this better than Wicked Lovely. Blodeuedd - It is kinda weird, but definitely worth a read. Petty Witter - you really do need to read The Knife of Never Letting Go first, as the second book won't make any sense. Passionatebooklover - definitely worth a read, if you like dystopian novels. Amanda - that is fine. We definitely can't all enjoy the same books. It won't appeal to everyone. Peter - I was thinking that too, about if people could actually hear my thoughts. I think I would have to be a lot nicer in my thoughts than I am presently. Debi - no worries. I know you are still on the first one. Carmen - it took longer to get into Rebecca than it did Jamaica Inn. I think I actually prefer Jamaica Inn. I get annoyed with the relationship between Maxim and his new wife. He treats her like a child. Missy - they are definitely worth reading. You know, I think one of the reasons why I liked it more was exactly because they were separated. I loved that it have us access to two different sides of the story. I can't wait for Monsters of Men! This is the first that I have heard of this author. Thanks for the great review on book #2. I haven't read The Knife of Letting Go yet, but I've heard such good things about it! It's going on my list, definitely. I didn't even know this one was out yet! I JUST picked up The Knife of Never Letting Go and I'm trying to decide if it's too long for the read-a-thon. I can't wait to get into this series!! So glad you love it.